Come here! I’d like to teach you something! 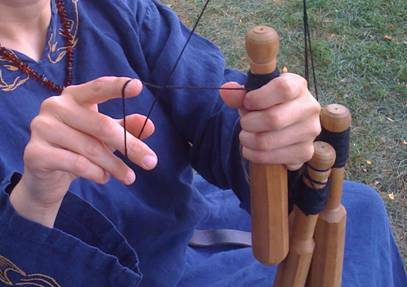 Many braiding and weaving techniques have been used throughout history to turn thin threads into stronger cords. 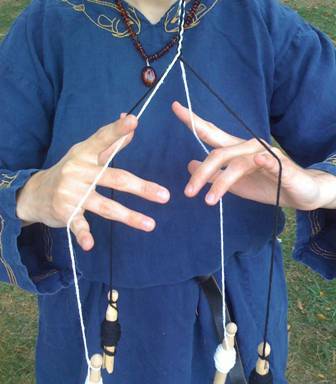 Most people in the SCA are familiar with the cords that can be produced through fingerweaving and lucet work, but there is a less commonly known type of braiding that may have been used in Scandinavia during the medieval period. 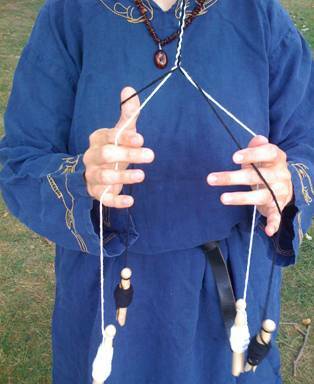 This is called either whipcordingor interlocking and uses four strands and four bobbins to produce a round cord. Some of the advantages to whipcording over fingerweaving include that it can be made in much longer lengths and can easily be dropped and picked up again as time and interest allow. I have found it to be much faster and easier than either luceting or fingerweaving. Stripes result when you pass the same colors during a stitch – always trading a white for a white and a black for a black. Begin this cord by having the same colors on diagonals from one another. When first learning the basic principles of whipcording, it can be helpful to practice with a partner for a few minutes. Each partner should control two threads, one with each hand. Be careful not to actually grasp the threads – the bobbins keep the threads from tangling and provide the necessary tension – simply let the threads run over your hands. Then carefully trade threads with your partner – right hand to right hand and left hand to left hand. The above photos illustrate a bad stitch – the black strings should be crossing each other, not winding around the white ones. Any time you see this sort of thing happen – where the strings wrap to the outside instead of forming a weaving stitch in the middle – undo it and try again. As you use up thread, carefully release more from the bobbin and adjust the cord’s height to a comfortable level. After a few successful passes, you can begin gently swinging the threads at each other, rather than directly passing the threads. Before long, you’ll see why this was a popular game with Scandinavian children until recent times! I look worried here, and justifiably so – my weaving strings are being held by my fingers and so are loose – they have lost the pyramid shape we are looking for and there is no tension on my forming cord. This is trouble! 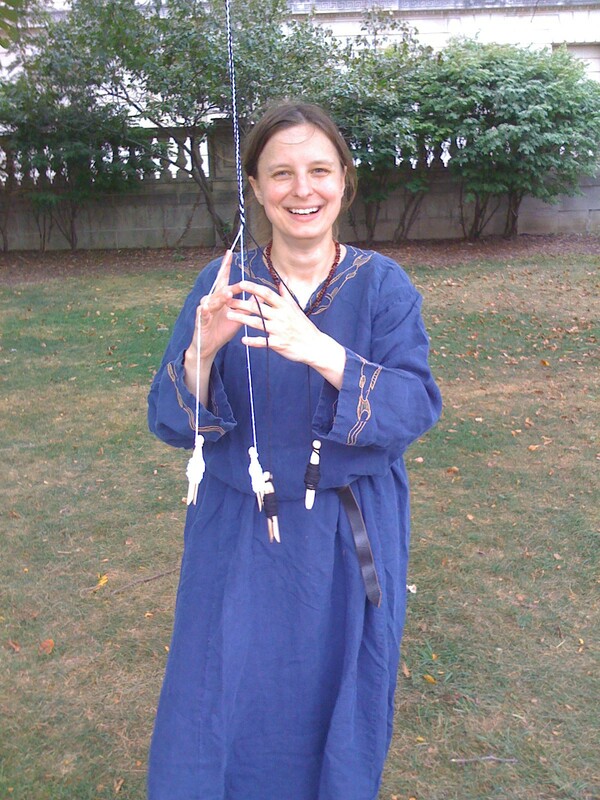 Correct tension – note the lovely pyramid shape above my hands. The index finger sticks up between the two strands and helps guide and separate the strands. 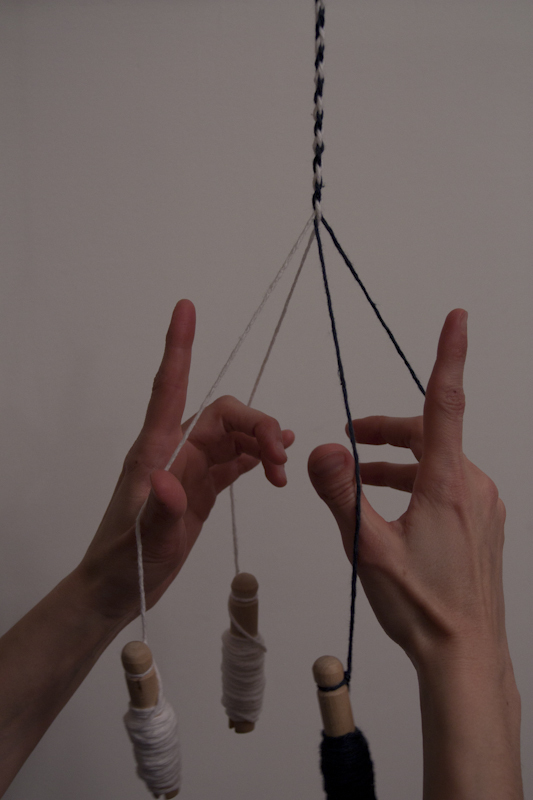 Carefully begin to pass the threads back and forth – each thumb trading a thread with the opposite hand’s fingers. Keep the thread running over your fingers – never try to hold it in the palm-side of your fingers as it is very easy to drop from that posture. Place your index fingers on the strings you want to move – in this case, the white ones. 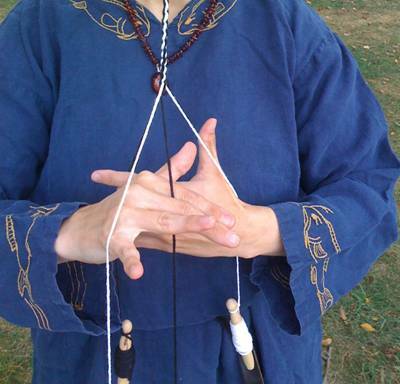 Push your hands past each other so that the white strings cross in the middle at the weaving point and end up on the other side of the diagonal from where they started. 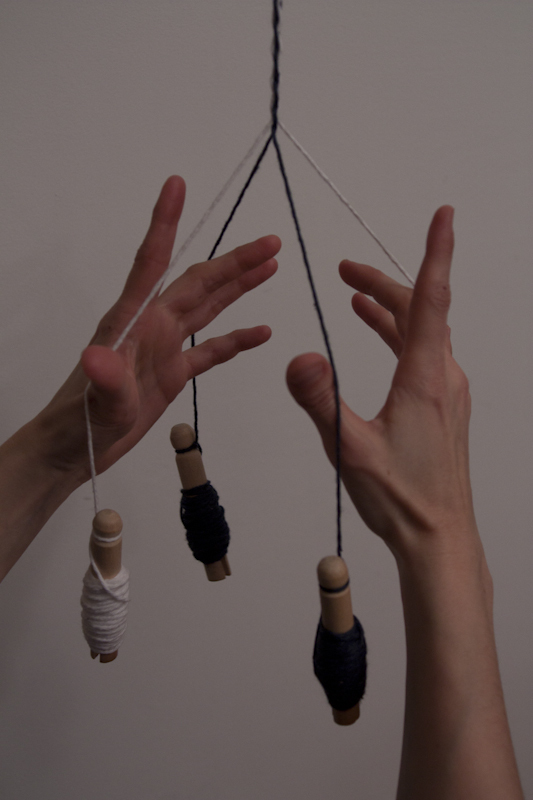 Use the BACK of your thumb and the BACK of your fingers to hold the threads in their new place. This is the tricky part because you are essentially dropping the string with one hand at the same time you are scooping it up with the other. 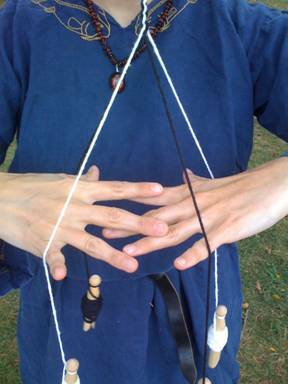 In the above picture, the top hand’s fingers will dip around the string they are currently holding and continue pushing the left string to its new position AT THE SAME TIME that the lower hand’s thumb will release the left hand string and push the right hand string to its new position. Place your index fingers on the strings you want to move – in this case, the black ones. 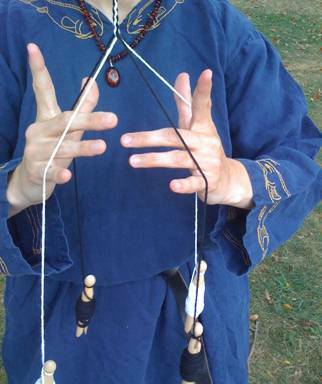 Push your hands past each other so that the black strings cross in the middle at the weaving point and end up on the other side of the diagonal from where they started. 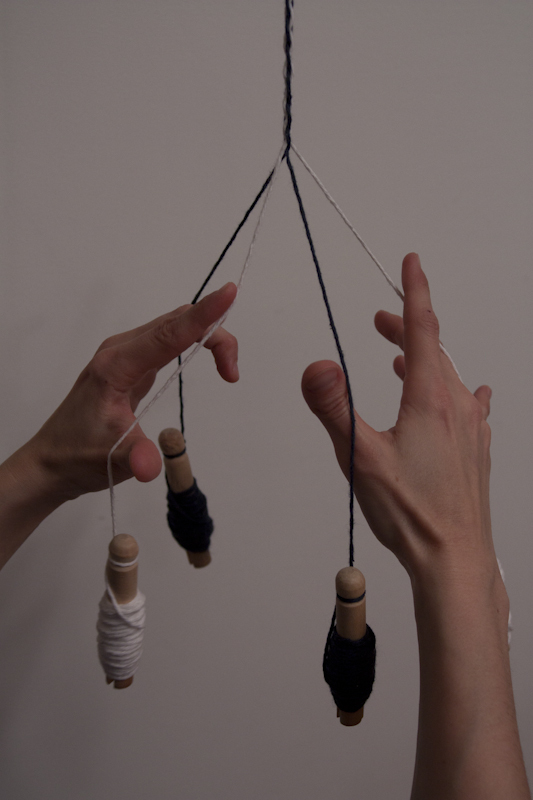 Use the BACK of your thumb and the BACK of your fingers to hold the threads in their new place. 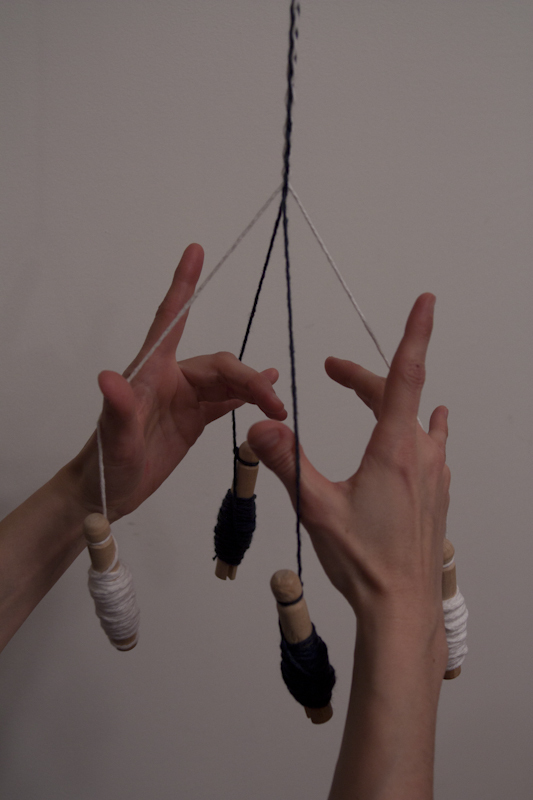 Strings are passed across the diagonal – here you can clearly see the outside of the pinky finger scooping the white thread to its new position. And – for the especially visually inclined – a very low-quality video is below! Making one of these sticks is trivially easy. Use one 3′ (1 meter) dowel and one 6″ (15 cm) dowel piece – or a craft or Popsicle stick, if you don’t have a saw to cut a dowel. Glue the middle of the short dowel piece approximately 3″ (7.5 cm) from one end of the long dowel with wood glue, super glue, or epoxy. Wrap around the glued spot with string or yarn to support the joint, and allow it to dry. Suspend your bobbins from the top arm of the stick and you are now a mobile weaver! 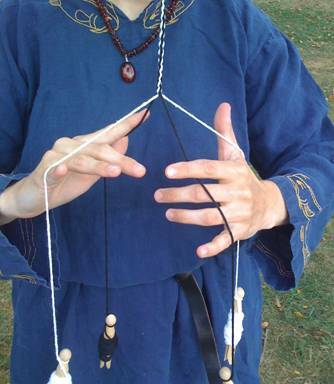 Since whipcording is such a simple braid, it is difficult to prove for certain that this method was employed in medieval Scandinavia. What we do know is that bobbins that could have been used in this way have been found and braids executed in this pattern were known. (Examples of four plait braids are found in Janet Arnold’s Patterns of Fashion as well as Moda a Firenze (Cosimo), providing some very late Renaissance examples.) For more information about the process of whipcording, see the references below. If you have more information, please let me know!